I've been going through my grandfather's papers this week, and it's a lot of paper to go through. Tossing pounds of physics notes from the 20's and 30's feels difficult yet necessary; the reams of investment newsletters from the 80's are easier to let go of. 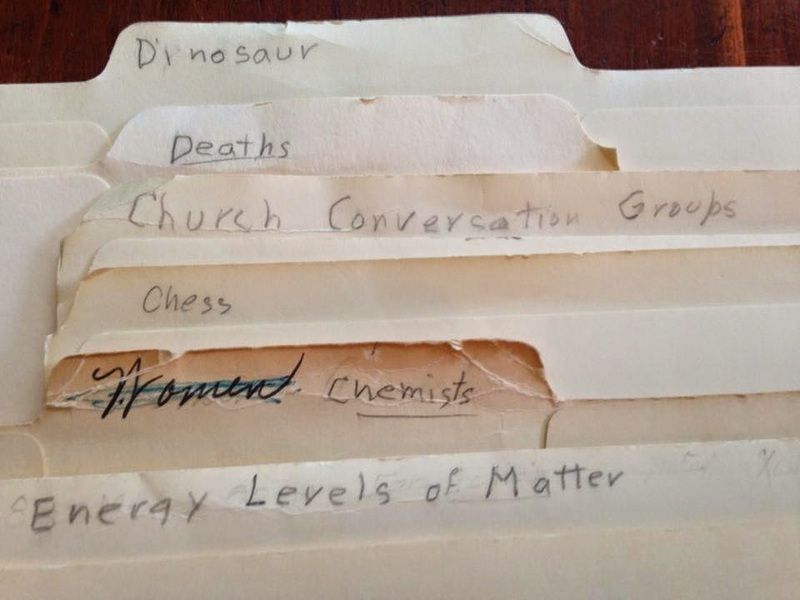 I'm preserving what resonates, and as a humanities-oriented granddaughter, that's almost all of the file folders themselves (see above for a sense of their rich variety) and any contents that are his own original writings on religion, science, self-improvement, and family history. Call it my disciplinary bias, but his English essays from the 20's and 30's have been saved, along with his outline of the bible. Yes, the bible. Orin P. Gard was often in his own world, as am I. Learned? Genetic? I don't know. I think I'll be writing off his papers at some point - not now, but someday. I don't understand the missile ballistics analyses, but I'm intrigued by a tension I sense in his files and writings between how he earned his living/supported his family and his religious beliefs/desire for a peaceful planet. Grandpa's notes on the first computer conference in 1946 are the subject of this article in Penn Engineering, which is accompanied by my brief reflections. His thoughts and pursuits were constantly shifting in scale and focus, and I love this legacy of an active mind. He speaks to me through his papers more directly than he could in person, singular as a dinosaur. What is gone is so important, and right here.